Wholesale Plastic Folding Tables are great for churches, schools, rental companies, event centers and sports facilities. Wholesale Plastic Folding Tables are constructed of High Impact Polyethylene - Commercial Quality Built for Indoor/Outdoor. Plastic Folding Tables are Lightweight and Easy to Move and Store. LOWEST PRICES FOR PLASTIC FOLDING TABLES SINCE 2001. PRICES INCLUDE 8% TARIFF IMPOSED BY THE PRESIDENT. Our Plastic Folding Tables are Commercial Grade and meet all the safety Standards. 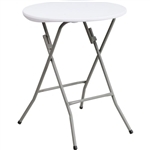 Plastic Tables have a 2” Thick top and Steel Extra Strong legs.The Legs on our Plastic Folding Tables have caps to prevents any floor marring. Plastic Folding Tables are great for the outdoors and can be easily wiped clean. 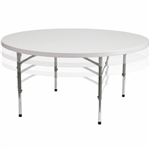 Plastic Folding Tables also work great with tablecloths.Round Plastic Folding Tables Round Plastic Folding Tables are most popular with Churches. Since they are made for the outdoors, they work great for all types of events. Round Plastic Folding Tables can be easily moved by rolling on the side. The Plastic Folding Table sizes range from 48” to 72” Round. The largest Round Plastic Folding Table seats 10-12 comfortably. Plastic Round Folding Table are great for weddings and banquets.Banquet Plastic Folding Tables.